The second round of testing ran smoother then the last, aside from certain gaps I still need to close in my lists. I had 2 games with my newly tuned Mother list. One game vs Skorne and another vs Ret. Extoler Soulward (2pts)The first game vs Skorne, I played fairly well and then I got hit with an assassination run where everything went more than perfect for the opponent. The scenario we played was SR2014 Scenario 8: Rally Point. In-between the 2 zone’s there was a forest. The Skorne player won the roll off and opted to go first. I chose the side where there was a wall in the zone, as that allowed me to dominate from behind a wall later on. Most of the Skorne models were deployed on my friendly zone’s side, while one unit of Swordsmen was deployed on the other side of the field. I decided to mirror the Skorne deployment and I deployed my unit of Reciprocators in front of his swordsmen. The rest went on my friendly zone’s side. Turn one he runs his swordsmen into the zone, hoping to either get it for himself in time or to at least contest it so that I can’t utilize it for scoring. He mixed up with the deployment of his medium based units, which caused one or 2 models to be somewhat stuck and left behind. The rest moved up in order to get to the zone asap. The beasts stay behind the medium infantry to avoid the drag of doom. My turn was pretty much run orders everywhere, the Reciprocators moved towards the zone (no real hurry as the objective is to just get into the zone and wall up. The swordsmen have no real treat vs the reciprocators when using Set Defense and shield wall. 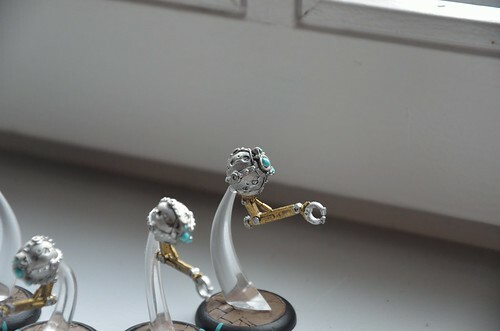 I also sent 2 of the Accretion servitors and 2 elimination servitors their way for support. They ended up holding the zone with no sweat and were able to clear a nice amount of the swordsmen during the remainder of the game. The other side of the table was more eventful. Initially I was able to clear the medium bases blocking the path to Molik Karn and drag him in. Despite all the reroll action I was only able to get him to 4 boxes left. Then again the turn after he frenzied and did minor damage to the axiom, making it less of a problem that he was still alive. Lesson to learn, even if Molik Karn is dead you need to hide your caster vs Skorne or it’s a sure kill. Conclusion: The Reciprocators are golden; having them supported with some servitors is certainly not a bad idea. The assimilator is certainly not best vs medium based models, however the groundpounder option for ranged and the weaponmaster on melee are really nice. Mother while by far the best ranged option for convergence, seems to be better played with models that can alternate between ranged and melee, then with a more ranged oriented force. This also works out well since she makes both rat and mat 8 during her feat. The Ret game was vs the same list as last week, Ossyan with lots of shooty models. Having the Reciprocators screen the axiom helped somewhat, however in the end just the presence of one upkeep pretty much determined the outcome of the game. Hitting models that are under the effect of Quicken is a real pain. Groundpounder does make it possible to “ignore the halberdiers and thin out the units following behind. A clever opponent ofc makes it very hard to remove more then 3-4 models at best per ground pounder. Having more than one assimilator felt like a life saver in this regard. Once I have a decent Father list going, I don’t think I’ll ever run my Mother list vs Ossyan again tbh, it feels way to one sided to be slow and having a hard time to hit outside of the feat. To this end I think Ret has a nice counter to convergence in Ossyan. I always said “I wouldn’t mind running him vs Convergence”, when I still played Ret and it turns out that wasn’t an incorrect statement at all. This Friday will be a day off from work, so we will be starting our games earlier and I might be able to get some more experiences than usual. 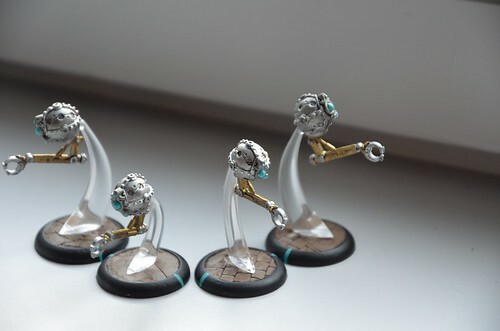 The attunement servitors are the second easiest form of servitor to assemble and painting smell round balls doesn’t takes that much time either. Lucant was a different model to say the least. After reading how others listed him as “a nightmare compared to Nyss hunters” I wanted to make him solid without the need for pinning every inch of this model. I ended up making indents in the resin base for each leg and his staff. This way the legs are essentially keeping the rest of the model in place insted of the torso. Second playtest night, managed to get 2 games in against Ret, and my opponant was playing Ossyan. From The start it looked like it was going to be an uphill battle for me. The ret list had stealth, high def, and high speed. Then there’s Ossyan’s feat which with some good rolls easily removes my 2 axioms. Both games went pretty much similar, Halbardiers had quicken and Desperate pace on them. This made them super fast and meant that outside of the feat I required 10’s to hit. The halbardiers may be a tarpit unit in this list, however they by themselves can rip an axiom to shreds. So the tarpit unit was both keeping me from getting far up the board and was threatening my main assets while also being pretty much immune to my rat5. The feat makes all the jacks rat8, which helps, however not being able to move up much means that even if the entire unit is removed from the table, there’s still 2 ranged units who will wreck pretty much everything under the feat. Against such combos it really stands out that we don’t have anything except for Lucant’s purification in order to remove upkeeps. I feel like that will hurt a large number of matchups. Mother is considered to be the factions ranged caster, at rat 5 that is doable, except against lists that have high def. Most othr factions run Eiryss and laught at any def upkeep, however we have no such option available in any solo. Within the current list there are no real options to come out on top. So for this friday I’m going to drop one Axiom, as a test, since I still want to make double axiom work so much. I’m also replacing the Diffuser again with a Mitigator. If the problem at hand is actually hitting, then knockdown is a key element. It will help the axiom to hit a drag target and it will give Attunement servitors better targets for their flare. Using the Reciprocators to keep the rest of the list unengaged longer. I added the TE UA because it grants several advantages. It can repare D6, it has a spray, a juicy mini feat for the unit and it grants ranked attacks which makes sure my jacks arn’t blocked when trying to shoot things. The attunement servitors are there to help with the rat5 outside of feat turn, and ofc to make hitting even easier during the feat. Optifex directive and Corollary are a no brainer, they make the list run smoother and longer, plus the option for magic weapons when needed has high value. The axiom seems like an auto include with mother to me, since she’s the one caster who can actually make most use of all it’s abilities. Synth has the second place, but even he can’t make the axiom more than rat5. I opt for 2 assimilators because one groundpounder is nice but 2 make it a verry deadly option. The Mitigator is there to help make targets easy to hit with the aoe knockdown. I’m verry curious as to how this new setup will perform. The largest problem for a player starting Convergence at this point is that there’s no real information pool to dive into. For other factions you could just go to endgamegaming.net and pick a list you like, and play it. And on top of that there’s good chances you’ll be able to watch a video of the list being played on a competitive level. I hope this will be the case for convergence in the near future aswell, but only time can tell. Will Pagani will be playing convergence at some point, I’m really curious which lists he will bring to the table and how he’ll play them, if he repeats his streak of bringing new models to the table and winning 1st place with them, things will be interesting to see. When I feel like I have a pretty good list combo for Mother (and afterwards Father) I will make more in depth reports on my playtesting. At this point it really isn’t that interesting, since I’m still learning the ins and outs of the models and I’m not the best listbuilder out there. This week the I was able to get a nice number of models done. I received Father Lucant last friday and I just had to assemble him asap. I found him less challenging than people make him out to be. 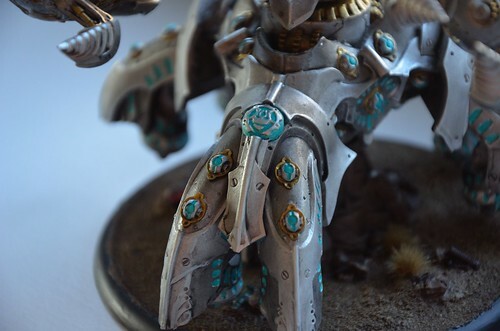 I made indentations in the resin base I used for him, for each leg and his staff. He was pretty solid this way and I havn’t found the need for any pinning. I managed to finish my first Axiom last night, and I’m very happy to have it sitting on my shelves finished and ready. I prepped the bases for both my axioms a few weeks ago, so I wouldn’t have to bother with that while also painting the model. The fact that the models rests on a rock allowed me to leave the base with the rock separate from the rest of the model. At this point both axioms are magnetized and can be split into 2 parts (top and bottom), however I may change this when I find a decent way to transport them in one piece. I was able to magnetize both well enough, and yet it still feels to cluncky. The first one is finished, and for the second one I just need to paint up the top part (roughly speaking 1 or 2 more nights of painting to go). Last Friday is had my fist few games with my Mother tier4 list. As these games were my first with convergence I made some rather large mistakes as well. I played my first game against skorne and the second against ret. Induction isn’t something you can master instantly. It’s a huge help, but you need to plan around it. Making sure vectors don’t spread out to much and all vectors end up having the focus they require. The axiom is a beast and bringing two is just godly. The axiom is a dream vector, it’s ranged capabilities are great and the fact that they work perfectly alongside the melee options is just icing on the cake. Mother is pretty solid and she’s not just a backline caster. The corollary is a godsend. It feels like playing with 11 focus and the some with Mother and induction factored in. Wonderful little steel bundles of joy, ofc one type is always more useful than the other. Reflex: I made my list with 2 groups of Reflex servitors, following the logic that they could hold off infantry long enough for the rest of the army to catch up. Reflex servitors in my opinion, exist for exactly that reason. Facing Skorne Nihilators they performed ok-ish, taking out a few, but they proved very sensitive to “run and engage” tactics. In the second game vs. Ret Halberdiers, they had fewer problems with being engaged; however they had a streak of either not hitting or not damaging, making those more like pretty fireworks than exploding mines of doom. So Reflex servitors will go from 2 to 1 group in my list as they did pull some weight, but not at all in proportion to their number. Elimination: Where the Reflex servitors failed, these little guys shone bright. They do not have any anti ranged tech, but make up for this by not being bothered with “run and engage” tactics; gunfighter is a key ability for them. Rat 5 would be a show stopper, if it weren’t for the option to aim and the availability of flare, making it possible to end up with Rat9, which is on the other side of the spectrum. 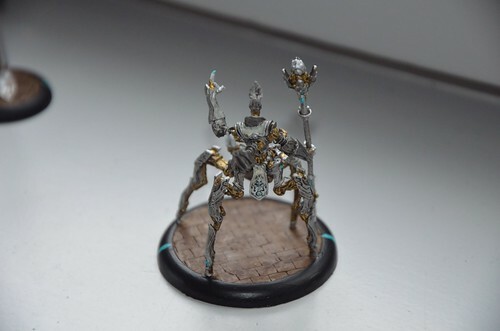 In the first game the elimination servitors only took out a few Nihilators and some support models, this was in part because I tend to hold things back to much. In the second game they actually whipped out half a unit of Halberdiers, and made me very happy. After dropping one group of Reflex servitors from the list, I have 2 points to spare and these guys will fill that spot nicely. Attunement: These guys are the oil that keeps the machine going smooth. -2Def is a nice debuff to hand out when most models on your side of the table have Rat 5. Combine that with the fact that the shot is a 3” aoe and as such even when you miss you could get a lucky scatter, and you have a nice package. They suffer from the same curse of low Rat the other models do, and getting close enough to targets often means no aiming, so choose the targets wisely as scatters are more often then not what you will be rolling. A good work around is making use of objectives, models standing b2b with them are also hit by the aoe and even a low rat servitor can only miss an objective on double 1’s. These guys are in the list and for good reason. Accretion: A good word to describe these would be “situational”. They are very handy when you want to get that one system back up on a Vector, and they are even cheaper than the other vector types. The main reason for adding them to my list is the combination of costing only one point and the tier requiring 4 groups of servitors. Let’s face it, the repair from the Optifex Directive is quite a bit better than that of 3 Accretion servitors. I like these guys, and they do make my list, but they will never make it to the MVP spot. Mitigator: Aoe 3” knockdown with puncture to the main target, it sounded very nice when reading the card. The range of this weapon (even with carrier group) wasn’t very helpful. The main reason this light vector would probe useful, would be when it were able to knock down a drag target so one of the axiom’s could have an easy hit. During the 2 test games it didn’t show much promise and because of that I’m going to switch it with a Diffuser for the next round of play testing. Beacon and luck are nice and rng 11, 13 with carrier group is in line with the range of the Axiom. Corollary: This thing is a squire on steroids and then some. Making mother’s control area 18”, effectively adding 4 focus to the allocation table (when correctly implementing induction ofc). Then there’s also the damage grid which prevents sniping it out with a random solo. I am at a point where I don’t think I’m going to build any lists without this little guy, because of this it’s no mystery that he’s in the list for good. Axiom: Where to start, these things are monsters. Just using initials you can get up to 5 shots and 2 melee attacks. If you shoot the Tow cable, drag, use the free melee attack, repeat this with the 2nd tow cable and proceed with the initial Accelspiker followed by buying an extra attack with it, you get an effective number of 10 attacks with 1 focus spent. And then there’s the option to go for Tow cable, Accelspiker, Tow cable and proceeding to buy melee attacks as well. In the first game I cleared 2 light Skorne war beasts on just ranged damage, there was no way to drag them over, and as it turned out there was no need either. When facing more of a troop spam in the 2nd game vs. Ret, I applied pretty much the same order of events, puncture shot a model, make the Accelspiker shots, puncture shot a model. The puncture mechanic is nice because it shuts out the need for boosting on damage and pretty much ignores armor on single wound models. Axioms working in tandem can both deal with infantry and hard targets, and that’s a good thing, the list wouldn’t be as viable without this. Spending that amount of points to end up with a list that can’t handle more than one thing would be really sad. Optifex Directive: These guys…. They make the list by default because they are a tier requirement. I’m happy to have them, repairs are handy. 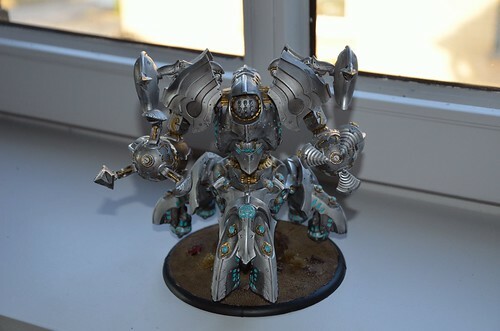 I have not had the need for magic weapons nor pathfinder so I know there will be games in the future which will allow this unit to fit into its role more. One thing to keep an eye out for, don’t let anything get range on them because they drop like flies. And since they are in many situations the best targets to go for, you don’t get second chances when you misplace them. The real sweetness lies within the CMD 10 which allows the servitors to be somewhat independent, and allows mother to remain further behind. Mother: A nice focus pool, good spell list with nice utility, huge control area which allows for nice radar sweep measuring. The feat can make you have a rat 12 battle group with aiming and flare. (This is my definition of godlike). Because of the corollary she can camp more focus and that takes her of the easy to kill at range list. The turns where multiple shrapnel swarms are a good option, are ofc a completely different story. More shooty servitors less explody one’s. Keep the Axioms side by side and use them as a moving fortress. Keep the optifex directive out of sight. Try to make use of the Diffuser on prime targets. Utilize all options available more (flare / +2 dmg/ Diffuser) in order to models more effective. More play test experiences after next Friday. When I first set out to play Convergence, I wanted to paint them up completely before putting them on the table. I have since decided that while painted models look better, I really need to get as much field time with these models as I can. Tonight I will be playing my first few games with the faction, and I’m pretty excited about it. I am planning to play Mother and Father for 2 list events and I will most likely add in Axis for 3 list events. This however all rests on my first impressions of the casters, without any play experience. With Mother, I want to utilize her ranged capabilities, but at the same time I want to pack a punch in melee when needed. The Axiom in my opinion is the embodiment of this train of thought. 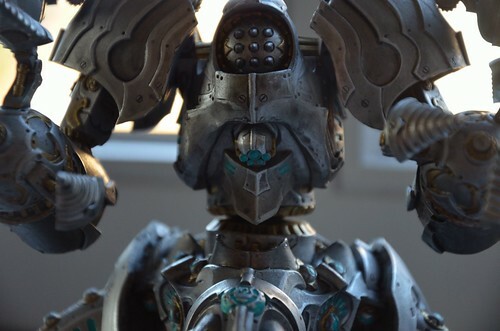 The axiom is also the only colossal I have ever looked at and said to myself, “I need 2 of these”. The corollary was a no brainer, having 3 jacks to power up and a caster who wants to be able to use her spell list, the extra 3 focus is a godsend. It also allows to make the jacks almost completely self sufficient. As for the Mitigator, that knock down aoe is just too nice to pass up, especially with Mother’s rat5 stat outside of her feat. Ofc there is aiming and there’s flare, but nothing is nicer then facing def5 and knowing you can only miss on double 1’s. Also another light in the list makes the induction process easier to pull off. The optifex Directive is a requirement for the tier bonus, however I would have added them even if they weren’t required. They are the Convergence choir, albeit somewhat toned down vs. the actual Menoth choir, but still a unit comprised of 3 awesome dudes. The option to hand out pathfinder, magic weapons or even repair other models, all in one package. And they only cost 2 points. 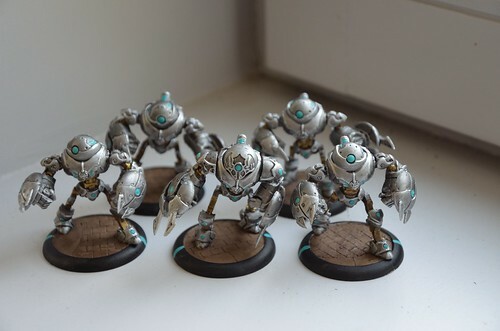 For the tier list you just need 4 sets of servitors, however you want all types during the game and you want certain one’s up front as fast as possible. I chose 2 sets of reflex servitors because I want them to be the front line, using counter charge to stall and remove as much of the opponents advance as possible. They may not be able to kill harder targets, but they will make it harder to reach the axioms. 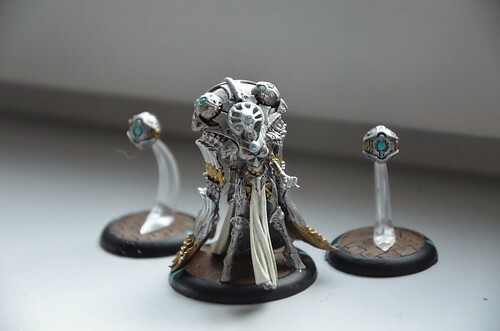 The attunement servitors are in the list because I want the freedom of positioning them where I need them early on and AD from the tier bonus allows exactly that. 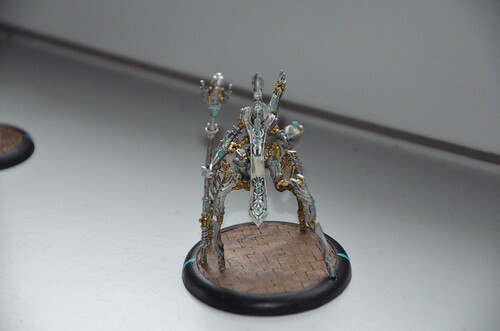 The Accretion servitors are by no means models I require to be there at the start of the game, however they are cheap and I need them to achieve the tier req. of 4 sets of servitors. 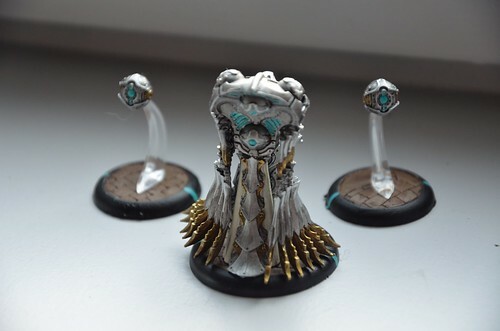 Depending on which models I am facing I can tailor which servitors are added on turn one and they don’t have to be the same type either. Will this list, in its current form, be fun to play while also being effective? I’ll know after some games. My second list is to be considered a complete experiment. I’ll be using Axis as a caster. Last week at Clogcon I faced a Butcher3 list with 4 Clam Jacks (ARM25 ftw) and flanking Pike men. It was a very nice list, and I wanted to see if I could build anything close to it within convergence. Axis was a good candidate since he adds bulldoze to the mix for the vectors, and ofc he’s our melee beast. And he has enough ways to make our vectors shine and to keep things away from them. The cipher stands out to me as our melee powerhouse, so 2 of those was an easy choice. I even contemplated on adding in a third. The Inverter was added because knocking things down is never a bad thing and his pow is on par with the cipher. The Reciprocators will flank the vectors; making sure things can’t ignore the metal wall advancing on them. The real weakness fir this setup is ranged treat. In the Butcher version that is solved by having an arm 25 wall, for the vectors that’s not an option and they will get some hurt from ranged. This is where the support comes in, having a optifex directive unit tag along means 3d6 repair each turn (if checks don’t fail), adding the ua to both the optifex and reciprocator units, turns that into 5d6. Now these ua’s cost as much as a unit of optifex directive each, so point wise not the best option. However! The ua also allows for a mini feat turn, during which attack rolls and skill checks can be rerolled. This makes repairs a certainty during the mini feat. The spray attacks will also help a bit when facing infantry. The steelsoul protector feels like an auto include at this point as Axis wasn’t graced with a clockwork vessel and thus can’t enjoy the same repair options as the rest of his list. A steelsoul protector however, can take the hit and then be repaired, and this can at least take care of some of those scary ranged assassinations. The servitors are there to make sure things either don’t make it to the jacks or so the jacks easily hit things. Axis’ mat + the flare debuff makes things pretty easy to hit. More on my lists soon, after I get to test some of this theory out. Speculation is fun; however putting a list to the test will give me much more information. 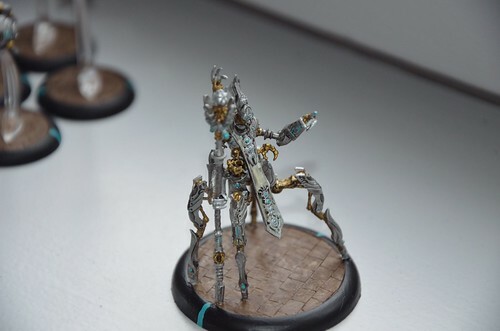 This week I finished up my first caster, Mother Directrix. I painted her in 4 parts, as otherwise I wouldn’t have been able to access certain areas at all. I kept the 2 blade cloak parts and the front cloth separate for painting, which allowed me to paint all the areas without too much hindrance. 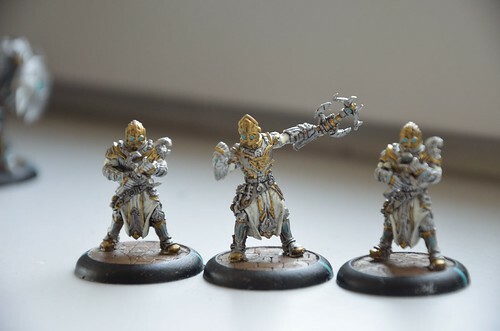 I also painted up my Accretion Servitors. I only have 6 of these opposed to 9 of the other types, as I (for now) don’t really see the need for more than 6, even in a Mother tier4 list. 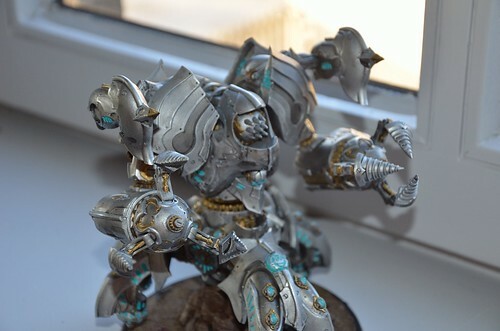 The next project will be to finish my Optifex directive and I also started painting up my 2 Axiom’s. So hope to get another painting update out next week. This weekend me and 3 other players from my local meta attended Clogcon (clogcon.com), a 3 day event in Rotterdam (The Netherlands). We saw familiar faces, met new people and had fun competing in the various events. With players from The Netherlands, Germany, Belgium and even the UK, it was quite the international gathering. In one of the events we even had a coc player, and I got to play him, so I got to see the mechanics from a cryx point of view. I learned 2 things from that battle, being fearless is golden against cryx and Aurora’s assassination is pretty solid. Then again not having played against the faction prior to that game, played a large role. 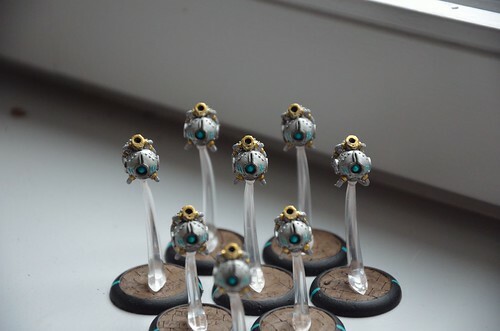 This week I will finish another set of servitors and hopefully Mother and the optifex directive. I decided I will not stick to the plan of not playing games with coc until I have it all painted up. I’m still 2 axioms and a ton of servitors away from having a completely painted mother list, and I want to get some hands-on experience asap. In short, first coc games will be had this friday, and I’ll try to have some insights on those games posted over the weekend.